Management of the Takoradi Technical University (TTU) has established a 100,000.00 Ghana cedis scholarship scheme to help needy but brilliant students to successfully complete their tertiary education. The scholarship forms part of the University's social responsibility commitment to ensure that brilliant children from underprivileged families have equal access to quality higher education. 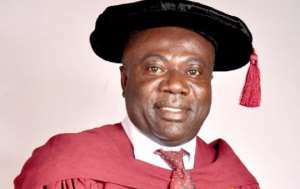 Reverend Professor John Frank Eshun, the Vice Chancellor of the University, announced this at the inauguration of a nine-member committee chaired by the Pro Vice Chancellor, Prof. Victor K. B. Micah, to ensure fair administration and allocation of the funds to the needy students. He said the University, over the years, had explored ways to assist students and other young people within the catchment area in order for them to access unlimited quality education. 'What is the essence of the University if it cannot give back to society and help the very people it seeks to develop for the betterment of society,' he added. Stating the mandate of the committee, Rev. Prof. Eshun indicated that apart from receiving applications for support and determining same, they were to source for additional funds to grow the scheme to include every young person in the country who may need assistance from the University. He challenged the committee to be fair in the discharge of its duties so that students who really needed support would be granted. Prof. Micah, on his part, pledged to work hard with the other members to ensure equity and fair administration of the funds. The committee members included Messeurs Emmanuel Diaba, Francis Rexford Sam, Gabbriel A. Okronipa, Bruce Apori Dompreh, Kenneth Boateng, Michael Asare Appiah, James Avevor and Solomon K. Owusu.